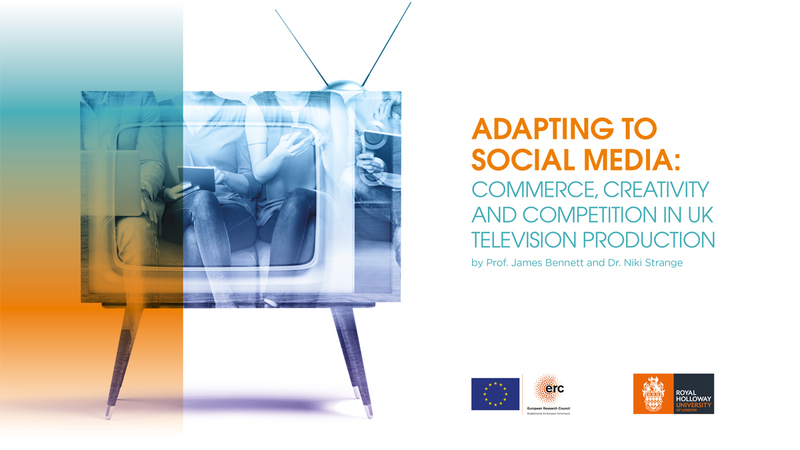 The ADAPT Social Media Project team has now published their final report: ‘Adapting to Social Media: Commerce, Creativity and Competition in UK Television Production’ by James Bennett and Niki Strange (May 2018). The report is free to download here. The report explores the impact social media is having on UK Television production and distribution. Whilst there has been significant concern with how social media is changing audience habits, this research focuses on the role it is increasingly playing as a production technology within the TV industry. Based on 57 one to one interviews with industry figures, along with 2 surveys of trade body Pact members in 2016 and 2017 and ethnographic observations of digital teams on The Voice, X Factor and Sunday Brunch, the report sets out how financial, organisational and business imperatives intersect with the sector’s production cultures, working practices and skills base to make social media a major concern for the industry’s future. 44% of our 2017 Pact member survey respondents regard social media as the most significant strategic, technical and creative innovation challenge for television producers, ahead of virtual (26%) and augmented reality (12%). There are already a range of companies innovating in this space, creating both compelling experiences and viable business models. At the micro level, new job roles and expertise – such as the ‘Preditor’ and the Social Media Manager – have emerged that are making particular skill sets a valuable commodity in the sector’s economy. But it is also clear that the industry needs to move rapidly as new players are ready to step in and exploit the social television market. Broadcasters find themselves competing with social platform operators who are increasingly acting like channels, adapting to learn the lessons of television’s past to secure their future. Television production companies find they must now compete or collaborate with digital agencies able to reach audiences ‘where they live’ on social platforms and in formats that speak to different viewing and consuming sensibilities. We provide new insights into the way television is produced that will illuminate both current industry practice and scholarship to understand the challenges and barriers for those seeking to address the social television opportunity gap.